Section 7-210 of the Administrative Code of the City of New York requires property owners to maintain any sidewalk that abuts their property “in a reasonably safe condition” and makes them liable for injuries proximately caused by their negligent failure to do so. The code specifically states that negligent failure to repair or replace a defective sidewalk flag is a failure to maintain the sidewalk in a reasonably safe condition. The New York Court of Appeals recently addressed whether this section could impose liability on an owner whose property did not abut the defect upon which the plaintiff fell. In Sangaray v. West River Associates, LLC, the plaintiff claimed he tripped on a raised area on a public sidewalk. The joint where plaintiff tripped abuts the Mercado’s property, but the sidewalk flag he was walking on ran from property belonging to West River Associates, LLC to the Mercados’ property. There was evidence that the flag sloped down in front of the property belonging to the Mercados. The plaintiff filed a negligence suit against both West River and the Mercados, alleging that West River violated the code. West River filed a motion for summary judgment, arguing that the plaintiff tripped on a defect that was in front of the other defendants’ property. West River provided a surveyor’s affidavit and a survey map showing that the joint was in front of the Mercados’ property. The plaintiff argued that West River had not maintained the sidewalk flag in violation of section 7-210. The Mercados argued that their survey showed that about 92% of the defective sidewalk flag was in front or on West River’s property. 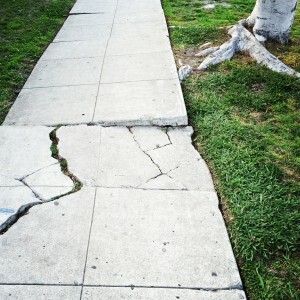 The trial court granted the motion, finding that the property owner only has a duty to maintain the sidewalk when the defect abuts the owner’s property. The plaintiff appealed, and the Appellate Division affirmed. The Court of Appeals, however, disagreed with the lower courts’ interpretation of section 7-210. The Court of Appeals noted that the location of the defect is a significant issue in determining the owner’s duty to maintain the sidewalk, but found that the owner of a neighboring property may also be liable for its own failure to maintain the sidewalk that abuts its property if that failure was a proximate cause of the injury. The Court of Appeals noted that most of the sunken sidewalk flag was in front of West River’s property. The plaintiff alleged that West River’s sidewalk flag was lower than the joint he tripped upon. There were therefore factual questions regarding whether West River breached its duty and if its potential breach was a proximate cause of the injuries. The Court of Appeals reversed the Appellate Division’s order. This case should resolve the issue of whether a property owner can be liable when the defect is on a section of the sidewalk abutting someone else’s property. A plaintiff may still recover from the property owner if the property owner was negligent in failing to maintain the sidewalk and that negligence was a proximate cause of the plaintiff’s injuries. Although the specific defect may be located in front of one property, the condition of the sidewalk flag as a whole may be a proximate cause of the injury. If you have been injured as a result of a defective sidewalk, a knowledgeable New York personal injury attorney can work with you to identify all potential liable parties.